As the resource officer at an inner-city middle school, Master Sergeant Travis Hinton is more than a hallway patrolman. He is a dependable adult figure wearing a badge of experience. Every day, Master Sergeant Travis Hinton surveys the hallways of Webster Middle School in Oklahoma City. 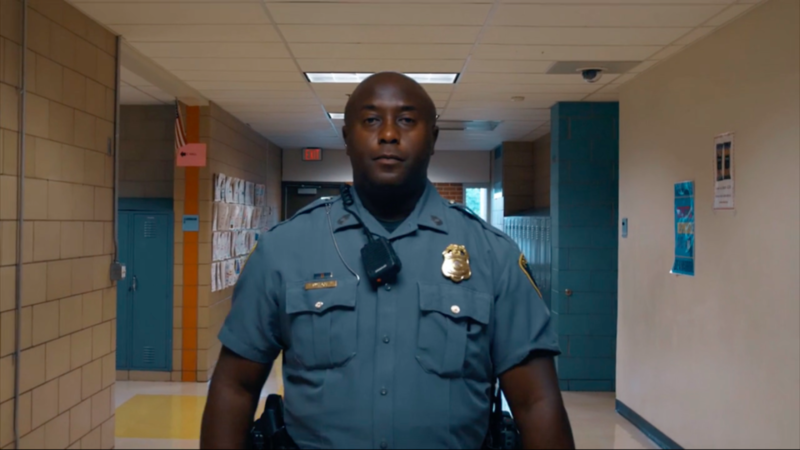 As the resource officer at this inner-city school, his job is to enforce the rules and keep the halls safe. Immediately, when they see me, they just see the uniform. Despite the authority that comes with wearing the navy blue uniform and gold badge, Sergeant Hinton has dedicated his career to breaking down barriers between law enforcement and students. His goal is to prove to students that their encounters with law enforcement don’t have to be negative. This is no small feat when you consider that many of the kids walking his halls have parents in prison. But Hinton isn’t like most law enforcement officers. He has been in the students’ shoes. As a kid, Sergeant Hinton dealt with a mother with drug problems and a father who was in-and-out of jail. He knows what it’s like to struggle through adolescence without adult figures to look up to. He remembers how instrumental sports were in keeping him on the right path. Even though Sergeant Hinton is not their coach, he helps out the Webster Middle School football team any way he can. Mostly, he just cheers them on from the sideline. But through that simple act, the students see him as a reliable presence they can look to for guidance and support. Whatever my coaches gave me, I give to them. Whether he’s patrolling the hallways or the athletic fields of Webster Middle School, Sergent Hinton doesn’t just wear a police badge, he wears a badge of experience the students can respect and relate to.